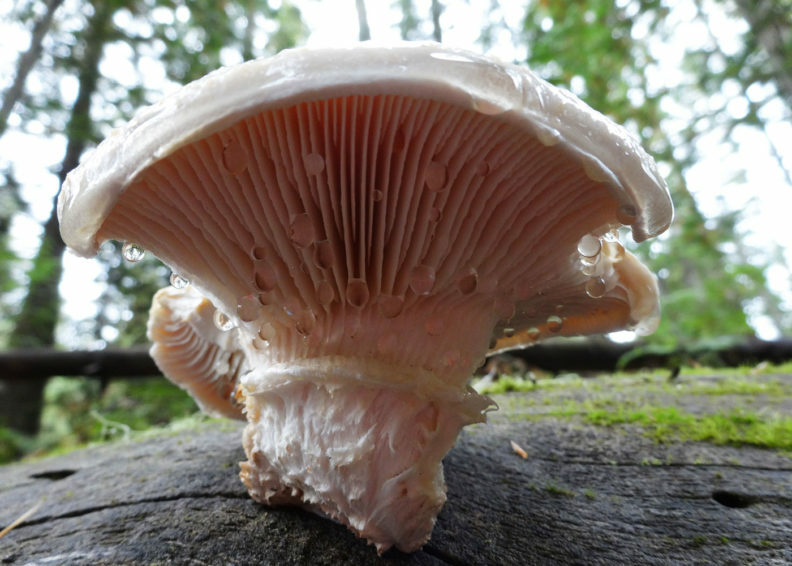 Neolentinus ponderosus, photo by WSU plant molecular biologist Pat Okubara. This mushroom grows on dead wood, and has very dense fruiting bodies that are as hard as wood when they dry. Agaricus augustus, photo by Pat Okubara. Agaricus is a common group of mushrooms that includes the cultivated button mushroom (Agaricus bisporus). 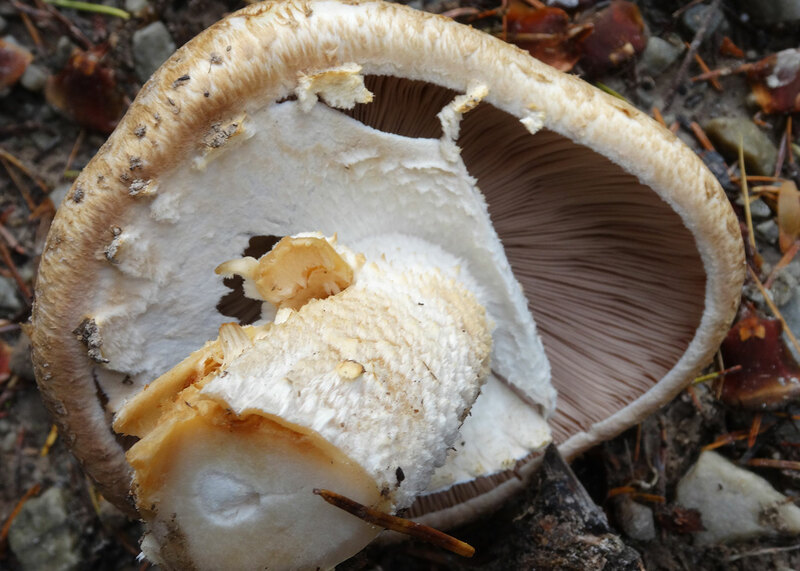 Agaricus augustus—known as The Prince—is a beautiful mushroom with stately fruiting bodies that have a wonderful almond scent. It’s considered a choice edible mushroom. Tricholoma magnivelare, photo by Lori Carris. 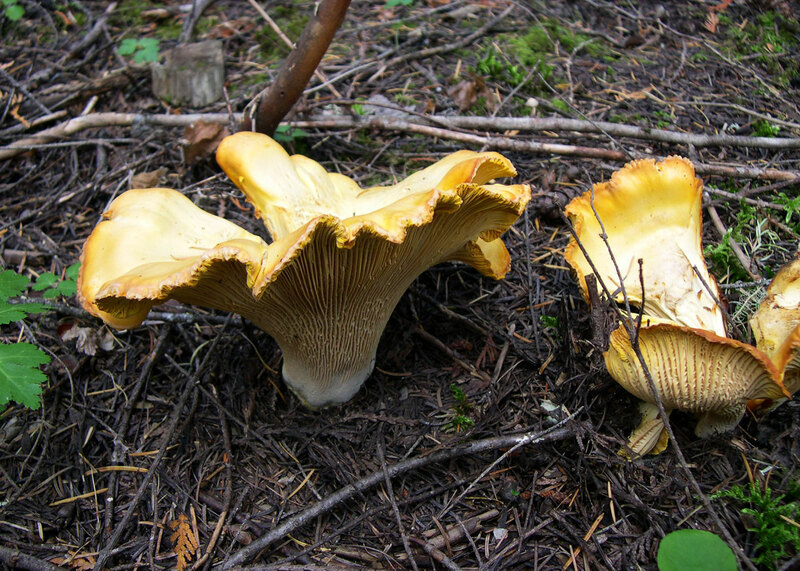 Matsutakes (the name means “pine mushroom”) is one of the most highly prized wild edible mushrooms in the Pacific Northwest. Most of the mushrooms are shipped fresh to Japan, where they are so valuable that a single mushroom can sell for more than $200US. 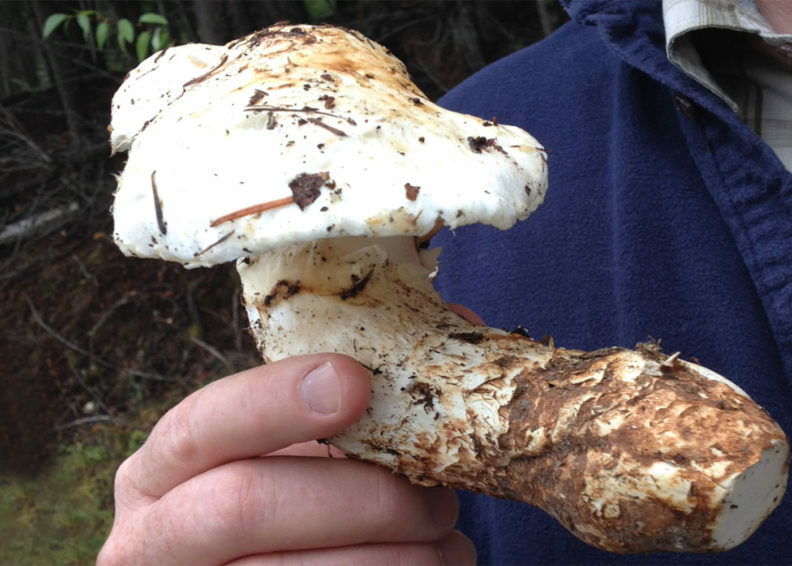 Matsutakes can be abundant in the Priest Lake, Idaho, area. 2016 was a very good Matsutake year. Hericium abietis, photo by Lori Carris. 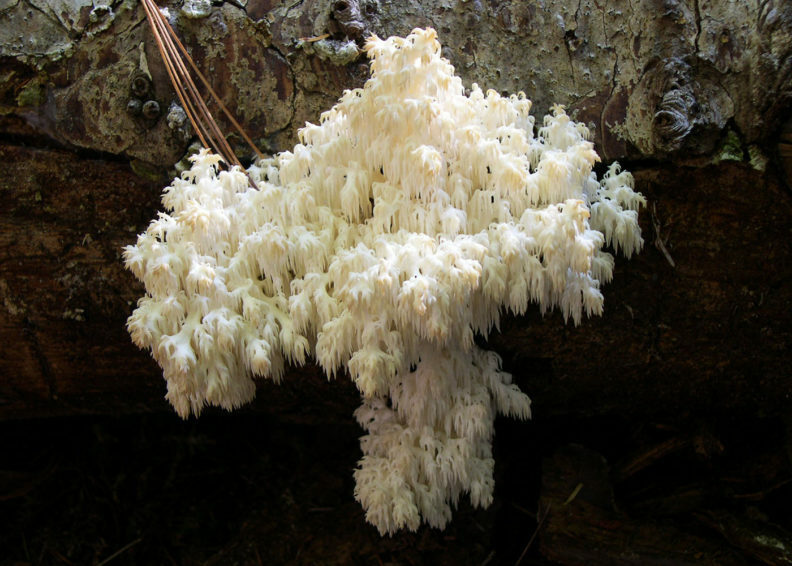 Lion’s Mane is an unusual fungus that looks like a mass of icicles growing from rotting logs. The fungus will fruit on the same log year after year, until the wood is too decayed to support further growth. It is a delicious fungus that has a nutty taste when sautéed in butter. This was an exceptional year for this fungus. 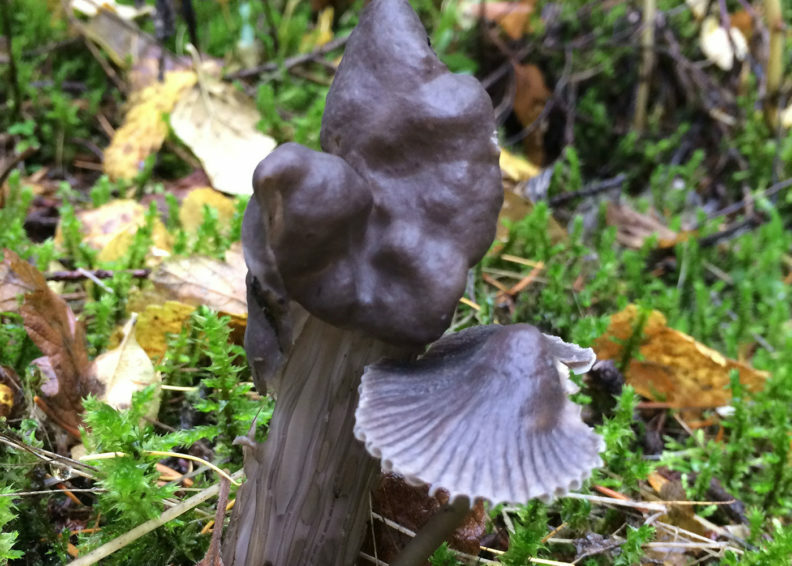 Helvella vespertina, photo by WSU graduate student Erika Kruse. The Western Black Elfin Saddle is an odd-looking fungus, with a beautiful pitted stalk and convoluted cap. It’s fairly common in forests in this region when there is abundant rain, but it could be found even on Pioneer Hill in Pullman. This photo was taken on Kamiak Butte. The mushroom growing to the right of it is a species of Mycena. Aureoboletus mirabilis, photo by Pat Okubara. A bolete mushroom, it has a beautiful cap that looks like rusty-red suede, and a pale yellow pore layer. 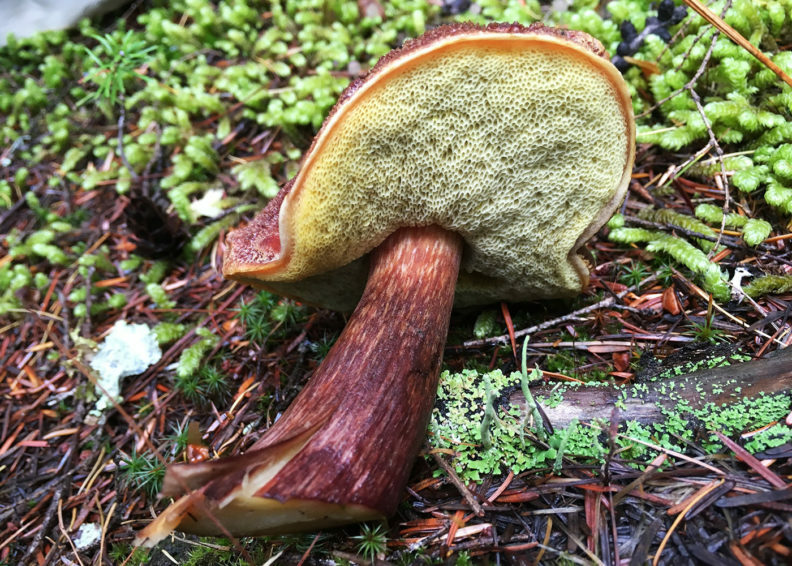 It grows from rotting wood—which is unusual for boletes since they usually grow from the ground. It is an edible species with some people saying it tastes lemony. Amanita muscaria, photo by Lori Carris. 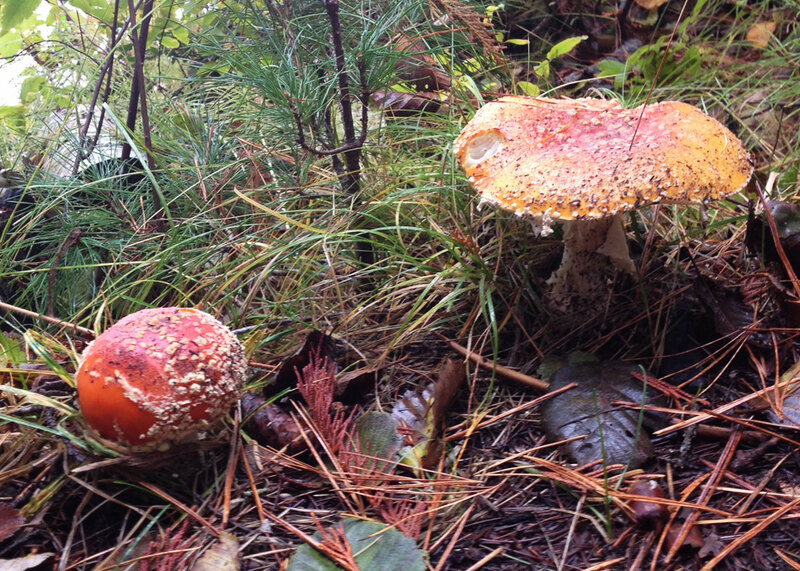 This iconic mushroom is commonly known as the Fly Agaric. Although a relatively common mushroom throughout the Northern Hemisphere, it is not found very often in the Inland Northwest. These mushrooms were found growing along a path by Priest Lake, Idaho, in mid-October 2016. 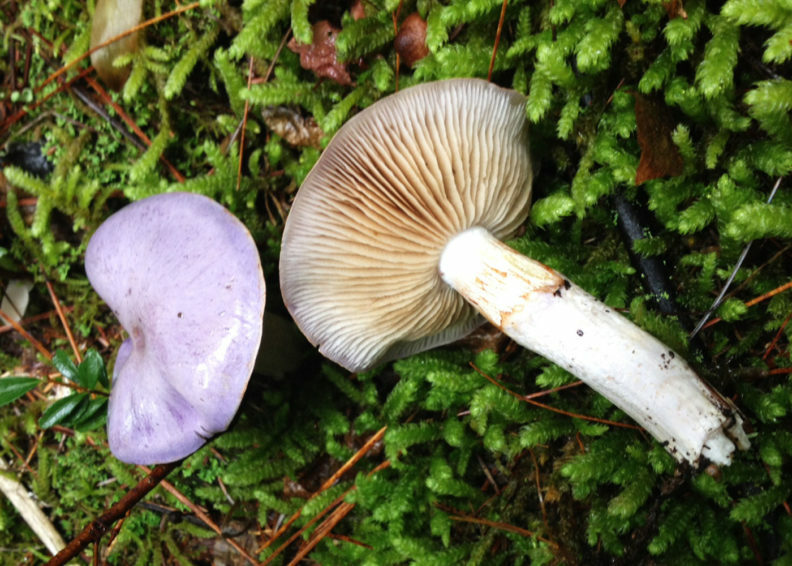 Cortinarius, photo by Lori Carris. This is one of the most common groups of mushrooms in the forests. There are hundreds of species, most are difficult to identify, and none are edible. Purple “corts” are some of the most beautiful mushrooms when they are young, as are the mushrooms in this photo. 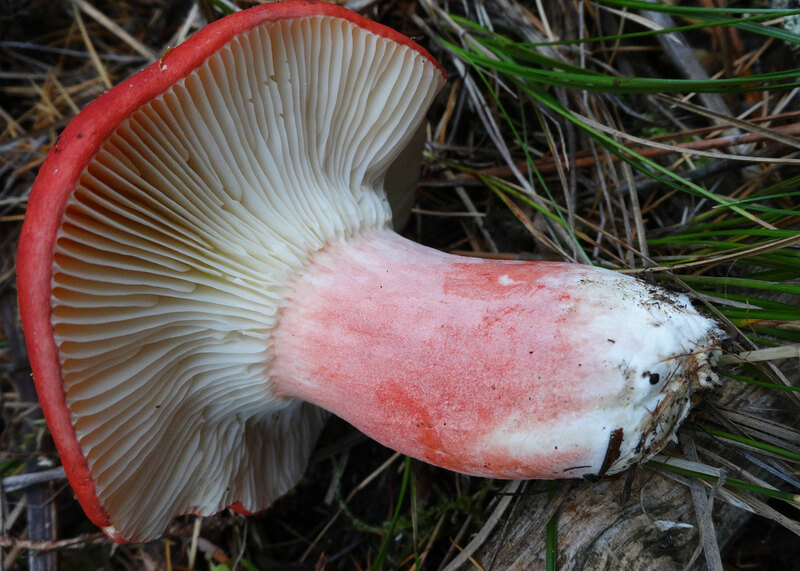 Russula, photo by Pat Okubara. The red russulas are some of the most beautiful mushrooms in the forest, and they were abundant in 2016. There are a number of different species of red russulas which are difficult to distinguish between. Pholiota limonella, photo by Lori Carris. 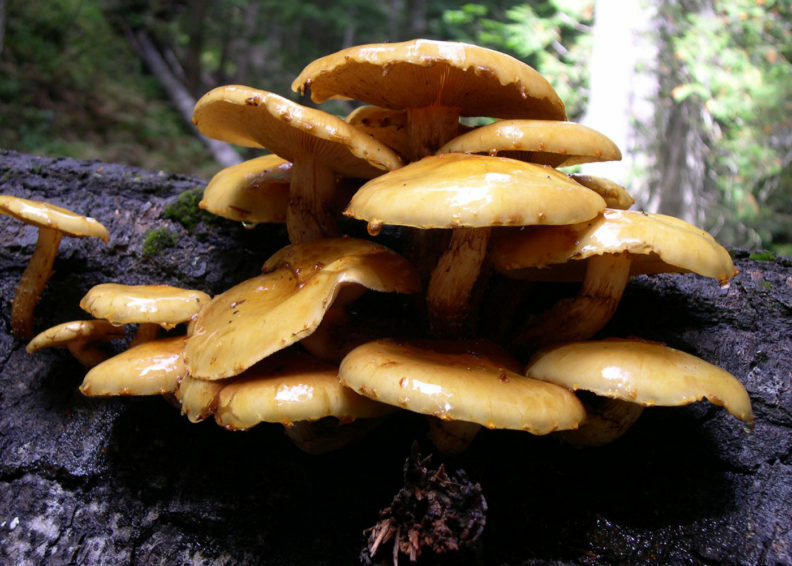 These mushrooms have slimy golden caps and grow in spectacular clusters on dead trees in the forest. There were a lot of this fungus fruiting in 2016. Cantharellus spp., photo by Lori Carris. There are several species of golden chanterelles in the Pacific Northwest, and all of them are choice edibles. Needless to say, 2016 was a good year for them, too.